1. Light the briquettes and add them to the smoker box of your Buccan barbecue. 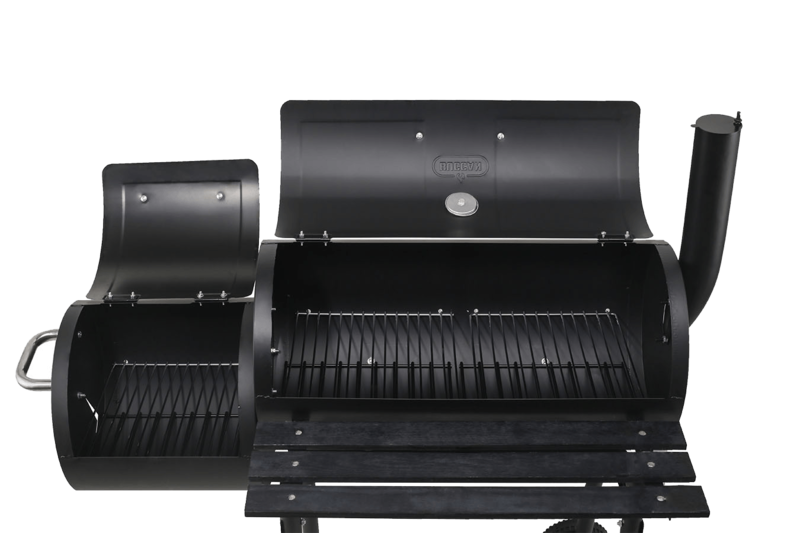 The smoker box is the smaller barrel on the left side of the barbecue (see picture on the right). 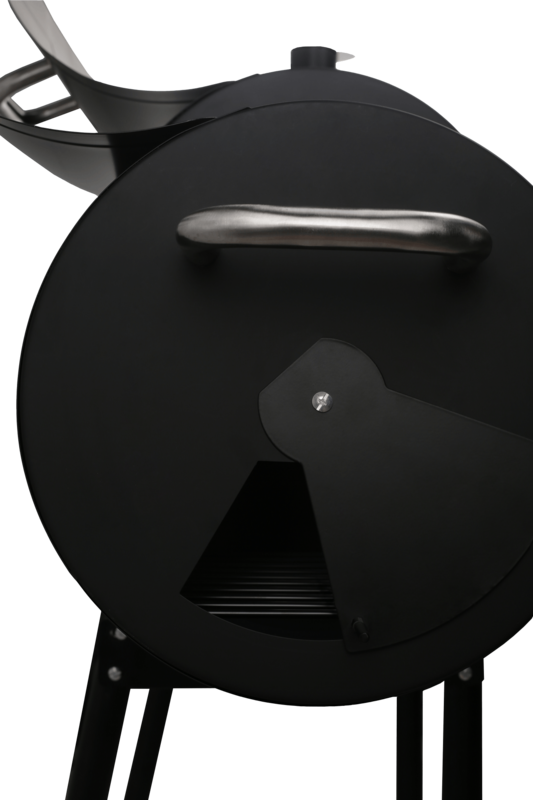 Pro tip #1: use the Buccan charcoal chimney starter to quickly light your briquettes. 2. Regulate the optimal BBQ temperature by adjusting the air vents. The intake vent is located on the left side of the smoker box and the exhaust vent on top of the chimney as illustrated in the pictures below. The principle of temperature control is very simple: opening the vents increases the oxygen flow and therefore increases the temperature, and closing them decreases it. Keep in mind that charcoal needs oxygen to burn. 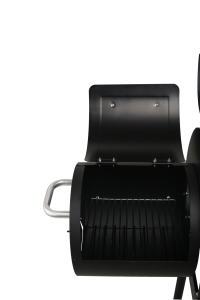 Adjusting the air vents allows you to set the optimal BBQ temperature. 3. Add the wood chips to the smoker box. Please read the instructions on the packaging of the chips. Some wood chips have to be soaked in water before being used. 4. Regulate the temperature by adjusting the vents so the main chamber (illustrated below) is at a maximum of 120 degrees Celsius (250 Fahrenheit). The exact temperature depends on the kind of meat you’re smoking. 5. Place the meat on the cooking grate inside the main chamber and let it smoke for the recommended duration. 6. Check the meat only a few times while smoking, since every time you open the lid, the temperature inside the smoker decreases. 7. If necessary, add briquettes and wood chips during the smoking session when checking the meat. Make sure to light the new coals before adding them to the smoker to ensure a stable temperature.  Pro tip #2: use the Buccan charcoal chimney starter to quickly light your briquettes. 8. Smoke the meat for approximately 1-2 hours, depending on the type and size of the meat. Pro tip #3: check the Buccan Chef’s Corner to find recipes. 9. Check whether the meat is done and re-insert it into the barbecue if necessary. 10. Enjoy your perfectly smoked meat! 11. 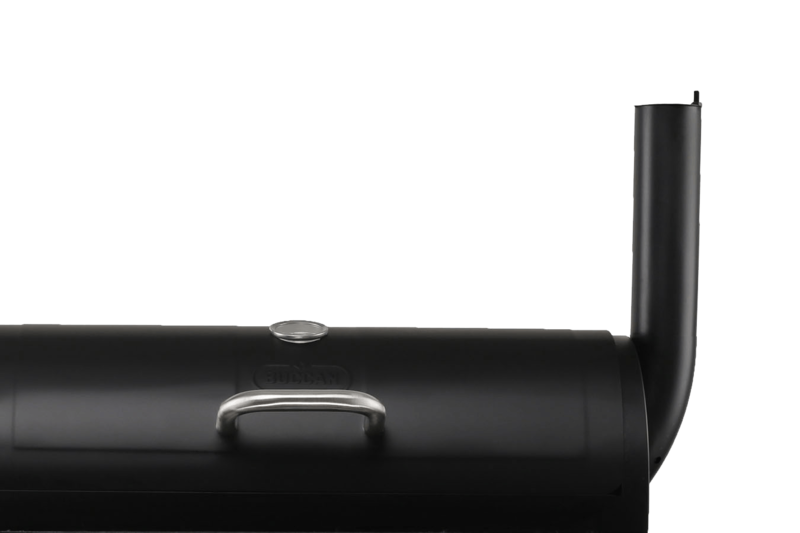 Pro tip #4: Immediately clean the smoker after you’ve finished smoking using the Buccan 3-in-1 cleaning brush to avoid left over food from clinging onto the grate. Briquettes burn longer and at a lower temperature than hardwood charcoal, making it more suitable for smoking meat. different flavours, such as for example oak, cherry and apple. Examples can be found by clicking here.